The challenge for Drive is collaboration. Everything is stored as structured data - JSON. Due to the structured nature mutations can be created, which reflect a specific change, but not the actual data itself. Mutations are kept forever until the file is deleted. In fact the mutations make up the file, a snapshot describes the summary of changes to give the current file, save having to process all the mutations, which could be numerous. Mutations are saved on the server and the client (your browser) otherwise collisions when collaborating can easily occur, having the transformation manager on the client allows the reconciling of the incoming mutations and your local mutations, which are then pushed back to the server to the other collaborators. This technique is also how you can work offline, as the mutations are stored and reconciled later. I have never done any Android programming, suffice to say it looks like a regular Java project with a touch of HTML (e.g. storing multiple resolutions of your images etc). Interestingly the IDE of choice, Eclipse with a plug-in is shifting to Android Studio. This is based on JetBrains IntelliJ - perhaps the gold standard of Java IDE (in cost as well), but free for Android developers. The instant success of the ChromeCast (nothing to do with that free Netflix subscription I’m sure) has a API available now. The ChromeCast is a receiver which runs web pages and you build the sender in your app (desktop, mobile, browser etc) to pair establish a connection with the ChomeCast. It looks surprisingly simple (famous last words). Since ABQ is now the center of the film universe directors look to local talent to fill various facets, which now include computer props. We saw numerous demonstrations of easy to use demos (single click for the actors) that make it appear as they type emails, send and receives replies all with a few random clicks. No surprise making the demos foolproof and loop-able was highly desirable, as was avoiding Windows for stability. For the final session we got a taste of what the the startup weekend events are like. A surprising amount of these events are cropping up around the state, not just in ABQ. We were given two disconnected words and had 10 minutes to come up with a business and 1 minute pitch, certainly a good ice breaker! 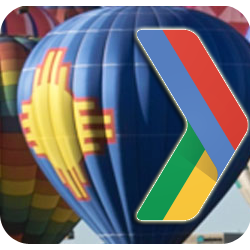 Overall it was an enjoyable day, my thanks to the GDG ABQ for taking the time to organize it and the sponsors (who doesn’t want to see a 3D printer in action?) for making it possible. I think almost everyone left with a prize as well, I won an O’Reilly book in the raffle (worth more than the cost of the ticket). I was really impressed with the ChromeCast API and think I have found my next Hack Day project for work.